"The fact that the name Max Lichtegg is today mainly known only to record collectors has nothing at all to do with the artistic importance of this singer. Lichtegg belongs to the large number of artists who enjoyed enormous recognition and success during WW II and into the 50s and 60s; this was due to their stage presence, recordings, radio broadcasts and television appearances. 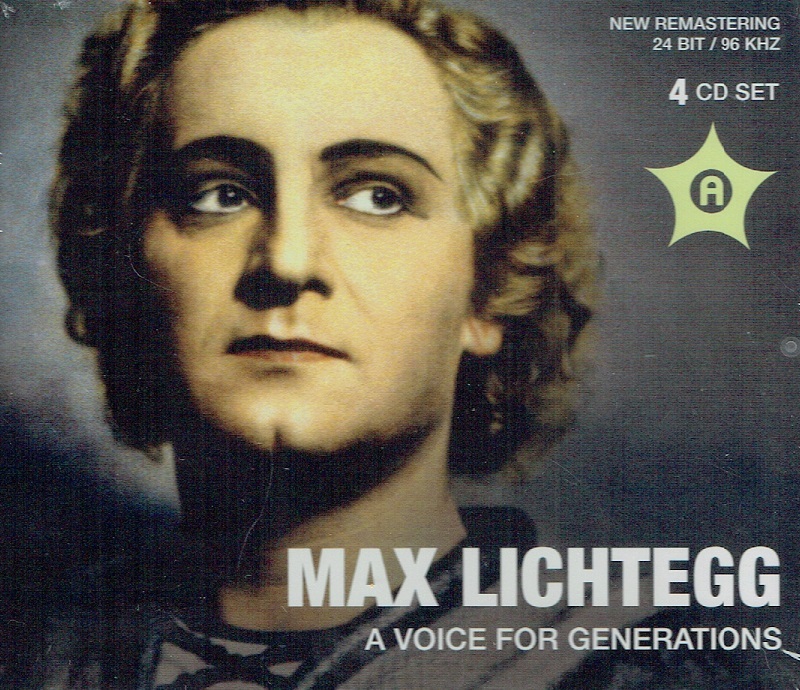 In his prime, Max Lichtegg was without doubt the most popular tenor in Switzerland. 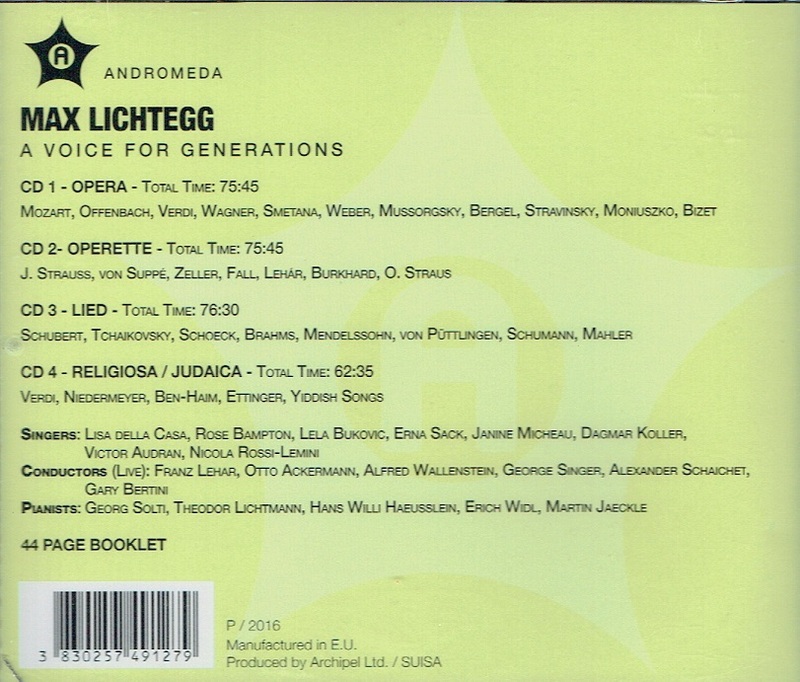 Max Lichtegg was born 1910 to Jewish parents as Munio Lichtman in Buczacz, a small town in Poland (now Ukraine). In 1934 Lichtegg won first prize in a voice competition; this resulted in a recording contract with Odeon and also his first stage appearances in operettas. Due to the political developments in 1936 Max Lichtegg decided to accept an engagement at the Stadttheater Bern (Switzerland). In 1940 he was offered a contract by the Stadttheater (now Opernhaus) Zürich. He remained there as a permanent member and as 1st lyric tenor until 1956. He appeared on that stage in a total of 44 different operas; he was regarded as an extremely intelligent interpreter in a repertoire that ranged from Mozart, Lortzing, Flotow, Wagner, Smetana, Tchaikovsky, Auber, Bizet, Debussy, Rossini, Donizetti, Verdi, Puccini, Mascagni, Richard Strauss to contemporary composers like Honegger, Stravinsky, Schoeck, Hindemith, Menotti and Henze. After concerts in the USA and stage appearances in San Francisco and Los Angeles, Max Lichtegg returned in 1948 to Switzerland. In spite of very tempting offers from the Vienna State Opera he remained, for family reasons, faithful to the opera house in Zürich. He made guest appearances in Munich, Hamburg, Stuttgart, Amsterdam, Paris, London, Bilbao, Lucerne, Geneva, Monte Carlo, Strasbourg, Schwetzingen and many other cities. Until 1971 he also could frequently be heard as a guest star at the Opera in Zürich. The Art Song was of the greatest importance for Max Lichtegg who was one of the earliest tenors to champion the songs by Britten or von Einem. Though the heavy part of Siegmund doesn’t come easily for the lyrical tenor, his impressively heroic portrayal of Siegmund was in fact his American début. He shows himself as a master of Wagnerian style as does Rose Bampton who sings a blazing Sieglinde displaying ample power and warm colour. The set ends with Beethoven’s ‘Der Kuss’ taken from Lichtegg’s final public appearance at age 78 in August 1988. 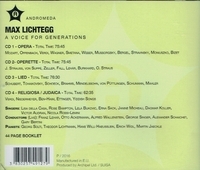 Time has dealt kindly with Lichtegg's voice though towards the end of his career the rock-like steadiness lost something of its quality but there was never a wobble and he was still able to thrill Zürich audiences as the late live recordings clearly show.